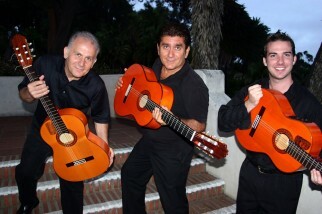 Novamenco, a family of musicians based in San Diego, are known for their modern flamenco style that fuses Jazz and pop with echoes of Ancient Byzantine. The end result is a unique blend of Jazz and soft Mediterranean grooves. In 1995, NovaMenco set up shop in San Diego to record and tour across the world. With flamenco guitars flourishing on stage, NovaMenco craft an eclectic mix of tunes that solidify their reputation as crowd-pleasers. Ever since NovaMenco’s debut album landed in the 1998 Billboard charts, the band has continued to innovate Modern Flamenco. The music of NovaMenco is attention getting with melodies said to evoke an air of distant Mediterranean lands and rhythms that exude feelings of liberation from this earthly existence.